Ladle Dryers are equipped with Nutec Bickley’s burners which promote a gas recirculation in order to increase convection heat transfer into the refractory lining of the pot, decrease heating times and increase the uniformity of temperature of the refractory. The Ladle Dryers have the versatility of being constructed with ceramic fiber modules, refractory blocks and/or concrete to reduce heat loss to a minimum. 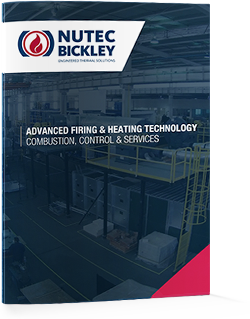 Nutec Bickley provides both configurations, vertical and horizontal ladle dryers, depending on the requirements of our customers. Nutec Bickley also has the capability to offer complete control and instrumentation solutions to suit the needs of each client. From as simple as a digital controller to the more sophisticated control including PLC, SCADA (Supervisory Control And Data Acquisition) and Panel View. High velocity gas burner in order to improve convection heat transfer. High density ceramic fiber insulation. Control panel with PID or PLC option. We design and manufacture Products for Combustion using leading technology.